Pyure is a organic stevia sweetener that is zero calorie and works great in both hot and cold drinks. 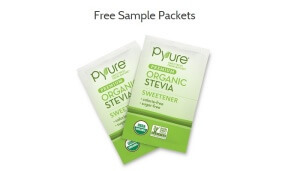 They are also offering free Pyure Stevia samples for those interested in trying out their organic stevia. Stevia products are great because they are all-natural and come from the Stevia plant. Stevia products are great zero calorie alternatives to sugar. I personally prefer a plant based sweeteners over the pink and yellow packets that are out there. Something about coming from a plant is more appealing than the processed sweeteners. There are a few other stevia samples available. Get yourself these Truvia sweeteners and Zing sweeteners that are available.